To fill the same sized plate with a hamburger and French fries you would have more than 800 calories. 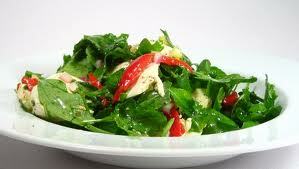 Of course, 333 does not equal zero so if you continued to eat salads all day your weight would go out of control. The myth of “negative calories” is an impossible dream. It takes very few calories to chew celery or mushrooms, so eating all you want will not make you lose weight. A vegetarian diet is not a magic bullet, but used judiciously it can help lead to good weight control and general good health. This is a good point. I think people get confused with healthy and fat loss. Yep, EVOO is incredibly good for you, but a 1/4 of a cup on every salad you eat will probably prevent you from burning fat. As always, moderation and knowledge is the key. What kind of salad dressing do you suggest ? I usually make my own salad dressing because even most salad dressings from the health food store use canola oil. 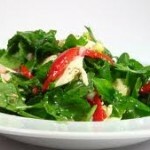 Use vinaigrette dressings not creamy ones. My basics are oil, lemon/apple cider vinegar, sweetener, salt, herbs and spices. If I already have avocado in my salad then I skip the oil.